Over Braided Flexible Steel Conduit typically used for machinery cables and wirings protection. inherent fire protection, high pull off strength and offers EMI screening. *Wire over-braiding provide more abrasion resistant and EMI/RFI shielding (EMC screening). *Overbraided conduits are particularly suitable for installation in vibration environments. Most suitable for use in industrial environments and high temperatures, such as wiring welding machines and metal casting machines; Also for demanding industrial environments where higher abrasion resistance or EMI screening are required. Flexible conduits with PVC covering and over-braiding. 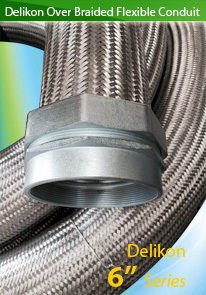 Delikon has introduced a range of braided nylon corrugated conduit and metal fittings with EMC screening capacity. Delikon Triple Braided Stainless Steel Flexible Conduit System is designed for high temperature applications with a high level of thermal resistance, protecting the power and data cables of combustion equipment. Delikon Over Braided Flexible Conduit and Metal Conduit Fittings designed with reliability as the top objective are the best to protect the cables of milling machine, boring mills, CNC machining center, or a machine tool. Delikon Flexible conduit and Fittings for Automotive Wiring Harness safeguard new energy automotive wiring. Heavy Series Over Braided Flexible Metal Conduit and Conduit Fittings protect iron mill cable. Over braided flexible conduit provide excellent flexibility and good mechanical resistance together with good screening against electro-magnetic interference, most suitable for industrial applications where a high level of thermal resistance is required. It resists abrasion or hot metal splashes. Delikon All METAL flexible conduit and ALL METAL connector is also used for Plenum cable protection. Braided Flexible Metal Conduit is widely used to counter mechanical stress and is highly flexible, and it is resistant against tensile stresses and transverse pressure. This conduit also offers excellent protection to cables against hot metal particles, and immunity from electromagnetic interference. Heavy Series Over Braided Flexible Metal Conduit resists hot metal splashes and is most suitable for steel industry electrical cable protection. Delikon EMI Shielding Heavy Series Over Braided Flexible Conduit and Fittings offer reliable protection for automotive industry automation cables, spot welding line cables, motion control cables, sensor cables and inspection equipment cables. Flexible metallic conduit, stainless steel wire braiding FLEXIBLE STEEL CONDUIT WITH STAINLESS STEEL OVER BRAIDING, This conduit utilises strip wound steel conduit as a core, which is then over-braided with stainless steel wire. 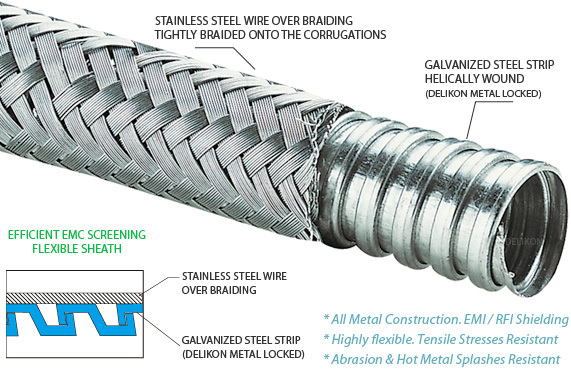 The wire over braid provides abrasion resistance and protects the core from mechanical damage. Over Braided Flexible Conduits provide high mechanical strength yet offer high flexibility. The conduit, at full extension, offers high tensile strength without elongation thus protecting cables from being over-tensioned or stretched. It will provide an enhanced level of EMI screening and a wide operating temperature. This heavy series over braided flexible metal conduit is excellent in protecting cables against hot swarfs in steel industry. Download the catalog page for DELIKON SM-70001 Over Braided Flexible Metal Conduit in PDF File format. Or have a look at other models of over braided flexible conduit and braided conduit fittings. Thanks to their very high level of shock and vibration resistance, Delikon heavy series over braided flexible conduit and fittings ensure reliable operation of your cables even under the most challenging conditions, whether in the drives of assembly machines, production lines, machine tools, packaging machines, or industry and process automation. The fourth industrial revolution is developing into a permanent technical evolution. Delikon heavy series over braided flexible conduit and fittings are already here to protect the cabinets and system cabling. In both control cabinets and system cabling, the key factor in achieving high availability of your electronic system is secure and failsafe connection of all components. Therefore, you need Delikon as a reliable single-source partner who can deliver modern, efficient and well constructed flexible conduit system to protect your control cabinets and system cabling. Delikon EMI Shielding Heavy Series Over Braided Flexible Conduit and Heavy Series Fittings protect FLNG and LNG facility automation and communication cables. Floating liquefied natural gas FLNG or LNG plants present unique challenges to cable management. Delikon EMI Shilelding Over Braided Flexible Conduit and Fittings protect the cables of monitoring sensors that provide large amounts of real time data for remote operations, and protect automation and communication cables, ensuring very high integrity and a very low probability of failure of control equipment due to cable damage. In such a dynamic industry, oil and gas companies today are looking for ways to maximize production while minimizing equipment and aotmation control system maintenance down time and costs. Delikon heavy series over braided flexible conduit and fittings system offers protection as well as emi shielding for electrical and data cables of control system for the continuous production, processing, transportation and refining of oil and gas products. Poor wiring or connections will result in poor machine functionality and or damage. When evaluating the need for control wiring installation or upgrades, donot forget to choose Delikon Automation Cable Management System that can provide qualified protection and shielding, keeping the interference from signal noise to a minimum. Heavy Series Over Braided Flexible Conduit and Conduit Fittings system specially designed for cables protections in steel mills, glass works and electric furnaces, resists hot metal splashes. Over braided flexible conduit also provides exceptional screening and shielding effectiveness from electromagnetic and radio frequency interference. A host of sensors can be used to automate steel mills and improve overall productivity and product quality. Delikon Heavy Series Over Braided Flexible Conduit and Fittings are here to provide additional mechanical protection, hot metal splash resistance, as well as EMI sheilding to Sensors and instrumentation Cables. New manufacturing plants and retrofits in the steel-making industry present growth opportunities for Delikon flexible conduit and fittings systems. Delikon has the right flexible conduit system to protect temperature and vibration sensors cables in hot rolling processes and other continuous casting, rolling, and final endproduct manufacturing, as well as flexible conduit and fittings for other types of sensors and analyzers. The harsh environment of steel mills demands tough cable conduit systems with reliable performance. Replacing cables costs time and money, and loss of data feedback or power puts product quality in jeopardy. Delikon Heavy Series Over Braided Flexible Conduit and Fittings offer a number of benefits that make them the ideal choice for the harsh, demanding applications in modern steel mills. Delikon flexible conduit systems are available in many different constructions including PVC coated, thermal rubber coated, and over braided types.To provide additional protection in harsh environments, Heavy Series Over Braided Flexible Conduit is available that can withstand hot metal splash and provide emi shielding to the data and power cables. Delikon flexible conduit systems are easy to install.